25/9/10 – Art market – Paris, Biennale des Antiquaires – The 25th Biennale des Antiquaires opened its doors on 15th September in much more elegant surroundings than two years ago. The map is also more readable and easier to follow, due no doubt to the fact that there are fewer stands than before. This selectivity, whether natural or intentional, also has its down side however : one cannot help but feel a little frustrated at seeing many French or foreign galleries missing from this year’s show. Obviously, this means fewer objects to discover, notably old paintings and sculptures (drawings are traditionally very rare at the Biennale). Still, both visitors and buyers will certainly find plenty to feast their eyes on. 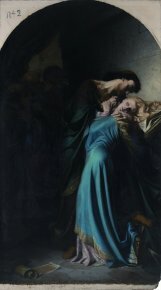 As always, we will point out here a few works that struck us as being particularly interesting, not necessarily the most spectacular or most expensive. 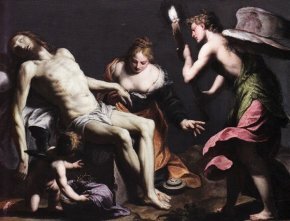 We start with paintings, at the Canesso gallery and an unusual canvas, at least for Michelangelo Cerquozzi known mostly for his bambocciate. 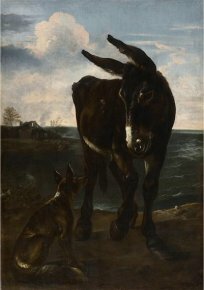 This is a representation of an Aesop fable, The lion, the fox and the donkey, depicting a conversation between the donkey and the fox (ill. 1). 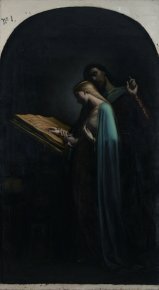 At the Didier Aaron gallery, there is a fine small painting by Alessandro Turchi, The Lamentation of Christ, executed on touchstone (ill. 2) and, still in Italian painting, besides a canvas attributed to Pietro Ricchi at Jacques Leegenhoek’s, we also point out a large anonymous, and very intriguing, canvas belonging to the Sarti gallery. 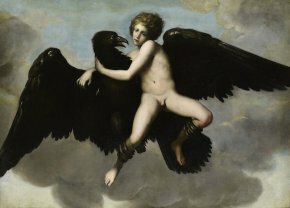 This Abduction of Ganymede (ill. 3) is perhaps by a Florentine artist active in Rome influenced by a Michelangelo drawing held at Cambridge. 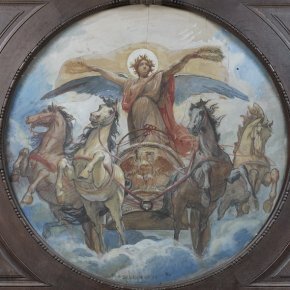 For the 19th century, not having found any particularly remarkable examples of Impressionist or post-Impressionist works, we prefer to mention, at the Bayser gallery, an impressive watercolour and gouache by Félix Barrias, in preparation for the ceiling of the cupola at the Musée d’Amiens (ill. 4) and two large Romantic paintings representing episodes from the lives of Heloise and Abelard by the little-known Léon-Marie-Joseph Billardet, a student of Paul Delaroche and Ary Scheffer (ill. 5 and 6). The Paul Bellanger gallery made quite a sensation with a sculpture à la Yves Klein, definitely an attention getter in this bastion of Classicism and Baroque. In fact, it is a terracotta bust by Carrier-Belleuse, of a woman painted in blue ! Obviously, this strange but temporary disguise is reversible. 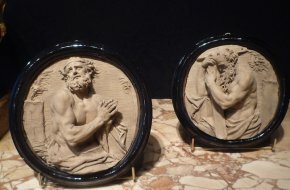 In sculpture, there are also, at the Anne-Marie Monin gallery, two terracotta medallions of saints by the Italian artist Andrea Brustolon (ill. 7). As always, art objects are everywhere at the Biennale but we regret not seeing, for example, the Chevalier gallery. Although there is quite a lot of 18th century furniture, the 30’s are also a strong point this year notably at the Vallois gallery, the Marcilhac gallery (a beautiful commode by Eugène Prinz) and the Franck Laigneau gallery. Again for the 19th century, some particulary stunning objects can be found at the Chadelaud gallery, for instance the “Miroir d’eau”, after the Grand Palais fountain by Raoul Larche, first presented at the Exposition Universelle of 1900. From the same period, the Jason Jacques gallery offers sandstone works by Jean Carriès as well as a sculpted desk by Carabin. We conclude by pointing out a very encouraging initiative : the organizers invited 25 promising new galleries to exhibit one object each, in order to introduce them to customers at the Biennale and perhaps enable them to participate in future salons. Information signs however, are very discreet and can be found upstairs, on the west side. Biennale des Antiquaires, Grand Palais, Paris, from 15 to 22 September 2010, from 11 to 20h, 22h on the 16th and 21st.